The SciFi-Ed project focuses on improving all of the above-mentioned areas, by providing teachers with tools, training, and guidance that will assist them in enhancing their teaching, making science more attractive to students, connecting it with real-life issues such as the environment, and providing girls and other marginalised groups access to science. The central project idea is to achieve this by incorporating Science Fiction in science teaching. Research tells us that the introduction of narrative in science education significantly increases students’ memory, interest, and understanding (Norris et al., 2005: 356). The consortium believes that Sci-Fi narratives, in particular, can bring about impressive improvement in European science education. Partners espouse the four reasons listed by Raham (2004) in favour of using Science Fiction to teach science fact: 1. the power of a good story; 2. Sci-Fi’s ability to make a potential future come alive; 3. its potential to make people curious about scientific concepts; and 4. its tendency to provide insights into the world. 1. To increase pupils’ motivation and achievement in science and other subjects, through the introduction of Science Fiction in education. 2. To enhance the quality of teaching Science and Technology, as well as an array of other subjects to children aged between 9-15 years old. 3. To connect science education with real-life issues such as the environment. 4. To provide girls and other marginalised groups with better access to science education. 5. To contribute to the improvement of initial teacher education and in-service professional development of science teachers and to the exchange of innovative teaching practices. In accordance to the above-stated aims, the General objective of the SciFi-Ed project is to create and disseminate a SciFi in Education Toolkit, which will strive to convince, guide, and support educators in introducing Science Fiction in education, gather and develop experience and knowhow in this field, organise it into solid and accessible bits of information, and make it available to stakeholders. University of Piteşti (UPIT) from Romania, partner in the consortium of the SciFiEd project, has participated in INTED Conference, 11-12 March 2014, in Valencia, with the paper titled "INCORPORATING SCIENCE FICTION LITERATURE IN TEACHING SCIENCES". 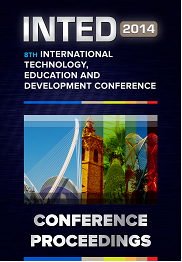 INTED 2014 (International Technology, Education and Development Conference) has welcomed educational experts from all corners of the world under a common aim: to generate thought-provoking ideas for innovative education and to promote international partnerships. INTED 2014 has brought together participants from all disciplines and cultures, attracting over 600 participants from more than 75 countries world-wide, making it a large annual meeting point for educators, teaching and learning technology experts and researchers. The paper presented by UPIT, "INCORPORATING SCIENCE FICTION LITERATURE IN TEACHING SCIENCES", emphasized on the key features of the methodology used within the SciFiEd project. A synthesis of research findings (both field research and desk research) upon the use of SciFi narrative in Romania, in didactic activities, and on its usefulness, potential of increasing learning attractiveness, motivation and results was equally presented in the paper. The last part of the paper underlined the elaboration of SciFi teaching units and the role/involvement of in-service teachers in designing and implementation of these units. With the occasion of 3rd meeting of the SciFiEd project held in Piteşti, on 17th and 18th of March 2014, a dissemination event was organized by the host institution (University of Piteşti – UPIT). The project coordinator, Mr. Charalambos Vrasidas, President of CARDET (CY) was interviewed by the local station "Prima TV". He spoke about the SciFiEd project, emphasizing on its objectives, target group and main outcomes. Also, Mr. David O'Connor from LMETB (IE) and Ms. Georgeta Chirleşan from UPIT (RO), as partners of the project, outlined the importance of the project for their institutions and for the end-beneficiaries. The news was released by Prima TV in the region of Muntenia (Olt County, southern part of Romania) and targeted a large audience composed by over 100,000 inhabitants.